Why do we have recess inside when you (the teacher) says it is not good air? My sister has asthma. Is it because of bad air? Is the air the same all over El Paso? At first, the teachers recorded the questions on chart paper, trying to stay as close to the child's wording as possible. Using this as an opportunity for English language development, the class practiced reading the questions together, aloud. Then the teacher asked if anyone in the class could give information about one of the questions. Then the teacher announced that the class would explore some of these questions in the next few lessons. Some questions will probably remain unanswered – a valuable way to develop a desire for inquiry. The third graders enjoyed Coco's story and wanted to read it to their first grade buddies. The first grade students created pictures of what they learned. It is easy to create buddy classes, just ask another teacher in another grade. Children love to be the "big buddy" and read to younger grades – a way to build confidence and self-esteem. Understand how breathing the air can affect people's bodies and health. Describe how colors and numbers can represent different classifications of something, such as levels of air quality. Understand that air pollution, driving, and health are connected. 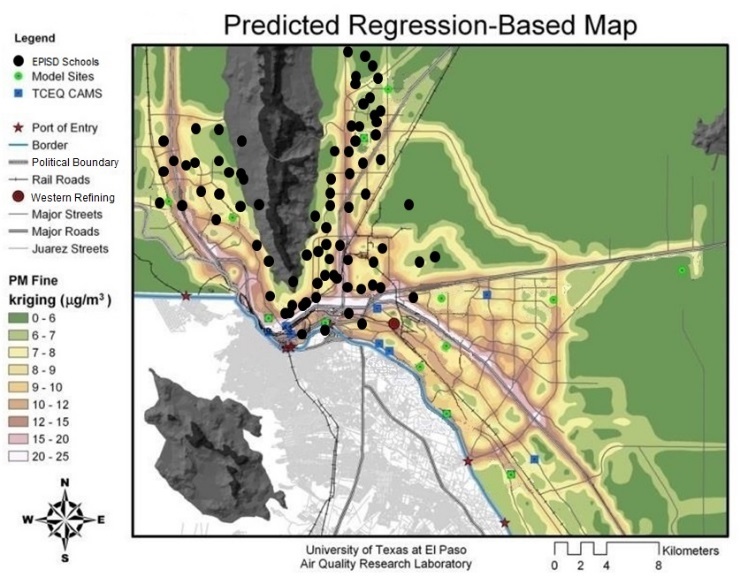 Using this as a foundation, the teachers in El Paso helped the children understand the levels on the Air Quality Index. The school nurse agreed to display a poster of the Air Quality Chart outside her office door. Every morning the third graders went to the AIRnow.gov website to find the daily ozone level of El Paso. One student reported that level to the nurse and helped her mark the level on the Air Quality Index chart. In response to the particulate deposits of the military maneuvers, the teachers wanted the children to gather particulate matter at different times and locations. Using the AQI monitor template, children recorded information and coated the grid with a thin layer of Vaseline. They placed them around the classroom for a few days and then examined the particulates that were collected using a hand lens. Students predicted how different locations might have high, medium, or low levels of particulates. Option:The teachers provided a large map of the school area. Just before leaving for the day, each child placed their AQ Monitor in a location in the school, and marked that location on the class map. They next morning they gathered their AQ Monitors and examined the particulate matter. They discussed the results, and tried to 'grade' the quantity of particulates in each monitor – no particulates, low level of particulates, medium level, high level. Then they color coded the school map with the level of particulates they found in that investigation. To extend the lessons, students made commercials or skits that would encourage others to reduce their dependence on driving cars. One group made commercials that were published in the middle school's weekly newspaper. Student enthusiasm for these lessons has always been very high. Ms. Steele's third graders "went wild" on the website for Air Quality Index. She allowed the students to direct further activities based on their questions and comments such as the following. The school is located near the military base, so students had much interest in the locations where their parents were deployed or had been deployed. It led to rich class discussions and students' application of the school lessons with personal and community life. - "Oh, Miss. Is that why they wear masks on their faces?" - "Why is the air so dirty there?" - "Let's look up Germany. We were stationed there!" - "My Dad's was in Afghanistan. Can I look that up?" - "What about Korea? My family lived there too!"